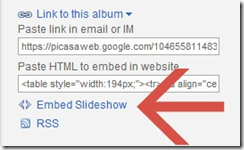 If You Have Used Embedded Slideshows from Picasa Web Albums, You Need To Read This – Learn Picasa and Google Photos! Several years ago, I wrote about how to use Picasa Web Albums to create a slideshow that can be embedded into a web page. The slideshow was really sweet, but it used Flash to make it work and Flash has fallen out of favor in the web world, and simply doesn’t work in many situations. Today, July 1, 2016, your Picasa Web Albums embedded slideshow will still work, but on August 1 it won’t. If you’re not sure if you’ve ever used the Picasa Web Albums embedded slideshow feature, then you probably haven’t. It was a pretty special/hidden feature. You had to go to Picasa Web Albums on a web browser, not the Picasa software on your computer. You had to know about the hidden command in the right sidebar, under “Link to this album” and then “Embed Slideshow.” That would present you with some HTML code that you had to copy and paste into the HTML code on your website or blog. On August 1, Your Slideshows will Disappear, What To Do? The writing has been on the wall that this feature would disappear someday … that someday is here. If you have used this feature, it won’t work after August 1. Here is the official announcement. If you know where your embedded slideshows are, and you’re willing to put in the time, you might be happy with the Google Photos Animation feature to show those photos, or maybe the Google Photo movie feature. Here’s a video I’ve made on how I’m using Google Photos Animations to replace the old Picasa Web Albums Embedded Slideshow feature. Chris Guld is President and Teacher-in-Chief at GeeksOnTour.com. She has been in computer training and support since 1983 and owned a Computer Training Center called Computer Savvy from 1983-1996. She was one of the first WordPerfect Certified trainers in 1986; President of the International Computer Training Association in 1993; Author of the Beginner’s Guide to Picasa and the PicasaGeeks.com website. She is now a Top Contributor for the Google Photos Forum and owner of the LearnGooglePhotos.com blog. She loves to teach! If you want to learn, you’ve come to the right place. Hi: following up on our email exchange of late September. With a lot of tweaking, I finally WAS able to make the new slideshow process work in the header part of my blog. I did this in my test blog. Then I decided to wait until after 10/1 to see what happened to the existing slide show in my real blog (http://wwtravelogue.blogspot.com/) before actually replacing the code there. 10/1…still works. 10/3…still works…today…still works!!!! So perhaps a) I actually set it up in a way that still works, or b) they have not really turned it off yet. Anyway, I DID notice that the slideshow widget I had in a sidebar on my other blog, has disappeared! No…it did not stop working and have a big “X”…it is gone from my layout! Am I imagining this? Don’t think so. So now I need to try to recreate this; don’t see how your technique will help here, so I am now researching this. Even now … january 10, 2017 – the slideshows are still working. I guess it’s better to expect the worst and not have it happen than the opposite. Go figure?! The animation solution is way to fast for anyone over the age of 30 🙁 I have at least 200 slideshows! Guess it’s time to find another solution ! Picasa Web Albums & photos embedded on websites. If this is true, then the lost slideshows are a minor problem. I have thousands of pictures on my 10 year old Blog about Ratisbon (regensburger-tagebuch.de). I can forget the last 10 years, if this anouncement is true. But I am not sure, if google expressed this correctly. And I cannont find any discussion about this topic. Do you know more? Thank you for this notice. My late husband put together his own slide shows for our photo group and I don’t believe he used Picasa for that. I’ll inquire into this and check it out.